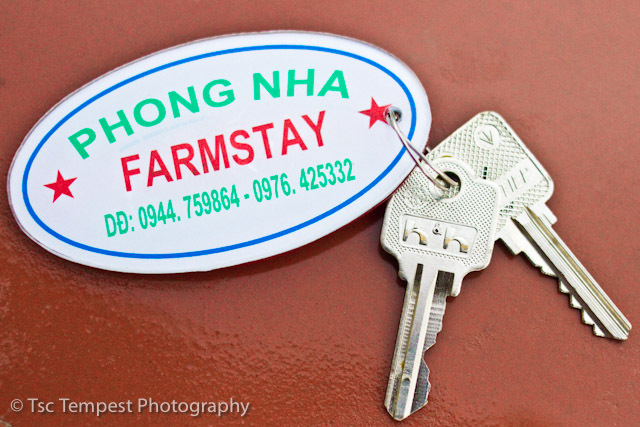 Recently we paid a visit to Phong Nha Farmstay near Dong Hoi, to carry out a bit of in-house instruction in the finer art of pie making and I’m looking forward to the welcome news of tasty pies being available in central Vietnam to hungry trekkers, spelunkers and trail blazers. As a consequence of this, we divested ourselves of a few pie tins, and only later found out that our Hanoi supplier was no longer bringing them in. Turns out it was just a delayed shipping issue and the tins have since become available again. However we’ve moved over to a small collection of self-cutting pie tins that The Pieman had brought back from Australia, last year. This has resulted in a slight change in shape and appearance of our pies. Lots of pies baking in the oven, in our self-cutting pie tins. This Week We’re Not At The Market. Just a brief note to let people know that due to administrative issues, Villa Tempest will not be operating a BBQ at this Saturday’s Weekend Market. As negotiations continue, we may be back in the near future. Watch this space. …And that’s the latest news from the Kitchens of Villa Tempest. Category General | Tags: | Comments Off on This Week We’re Not At The Market. As many of our customers are currently away traveling to escape the Summer heat, and since pies are not so popular at this time of year, we have decided to shorten the menu to our current, “Most Popular” items. This will make it easier for us to supply customers who have chosen, like us, to enjoy the humidity, and also to ensure product quality and food security. With this heat, we feel it is necessary to reduce the risk of product loss, caused by intermittent power supply and under utilization of raw ingredients. Just a quick not to let you know that the Tay Ho Weekend Market has closed its doors for its Summer Break. It should be back up and running by the Aug. 20. We at Villa Tempest would like to thank all those who came to the market and sampled our sausages and hamburgers. If you’re traveling during the Summer ‘School’ break, we wish that you have a safe and pleasant journey and look forward to seeing you when you return. Over the next few weeks, we’ll be running a ‘Sausage Sizzle’ and ‘Hamburger Grill at the Tay Ho Weekend Market. Our goal is to use, as much as possible, fresh ingredients sourced primarily for other vendors at the market, in order to showcase the wonderful produce that is available. Our Fresh Vegies will come from the Rau hữu cơ Thanh Xuân Organic Vegetables. Well, its been a while since we last updated this page, so here’s some of the latest news. A short while back, Tsc, “The Pieman,” stepped onto a hidden cavity, under the road, which caved in and buried him hip deep in the road. To add insult to injury, an old neck and shoulder injury of his was aggravated as well, making it almost impossible for him to roll pastry. Short answer – use the down time to continue adding capital equipment to the bakery. So, now we have a 4.5m x 5m room, a chest freezer, a fridge, a marble top bench, and a commercial quality, single deck, baker’s oven, which will double our baking capacity from 10 pies to 20 pies in one batch. 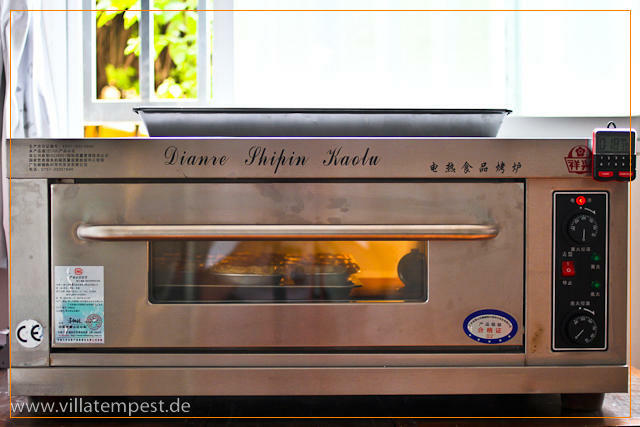 Having now commissioned this Chinese made oven – it’s from Gangzhou, Guangdong, China; it’s now down to tweaking the settings so that the pies cook well on the bottom without burning on the top, see the oven thermometer in the above picture? – it’s taking a bit of finessing, to say the least. Well, you can’t test an oven without having a few pies in it for the test, we opted for Chicken variants as a start, and may finish of with a few fish pies later in the day. 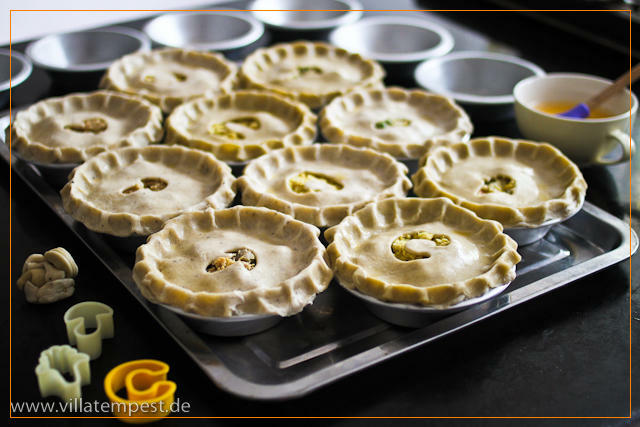 Anyhow, here’s a close up: Chicken & Mushroom, Chicken & Vegetable, and Curry chicken (Ca Ri Ga) pies ready for baking. 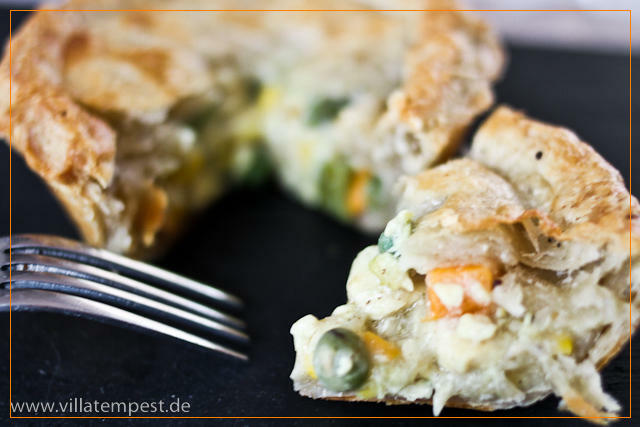 And, here’s what a Chicken and Vegetable pie looks like out of the oven… De.licious! Notice the flaky, crispy pastry; the real vegetables; and, the moist, but not too runny, filing. This is a very tasty Chicken & Vegetable Pie. To all our past customers, and future customers,we’d like to wish you all the best for Easter, and we hope to fulfill your desires for top quality pies once “Family Tempest” returns from celebrating Janine’s birthday in Hong Kong. With a few more tweaks, we should be back up and running, and baking regularly, shortly after Easter. That’s all for now from Villa Tempest. Wow! After a whirlwind visit to “The Longhouse” Raymond Island, Australia, we’re finally back in Hanoi and looking to get settled in again. It’s been a couple of weeks and we’re missing all our friends. Catch you all soon. B4N. Category General | Tags: | Comments Off on We’re Back!